Baby it’s cold outside! Even if it’s freezing cold and snowing this Frozen Hot Cocoa hits the spot, but is sure to be a year round favorite. 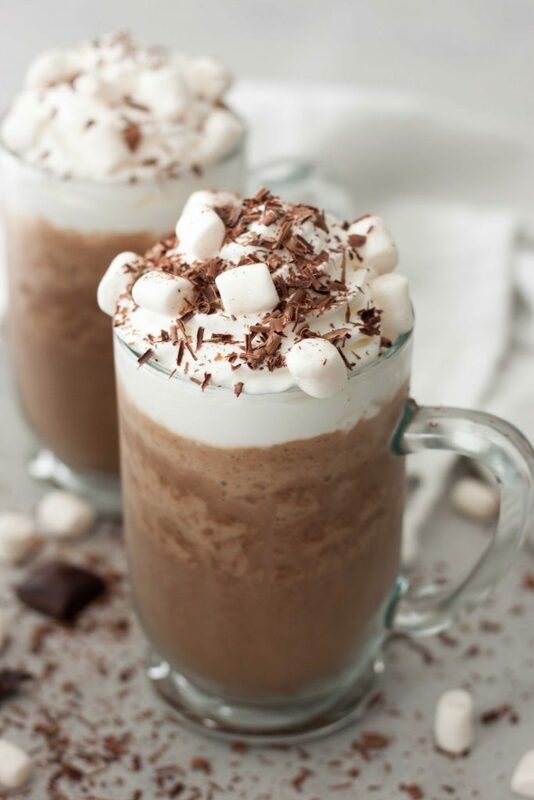 Tomorrow is National Hot Cocoa Day, yeah I know mine is frozen but still….. chocolate! 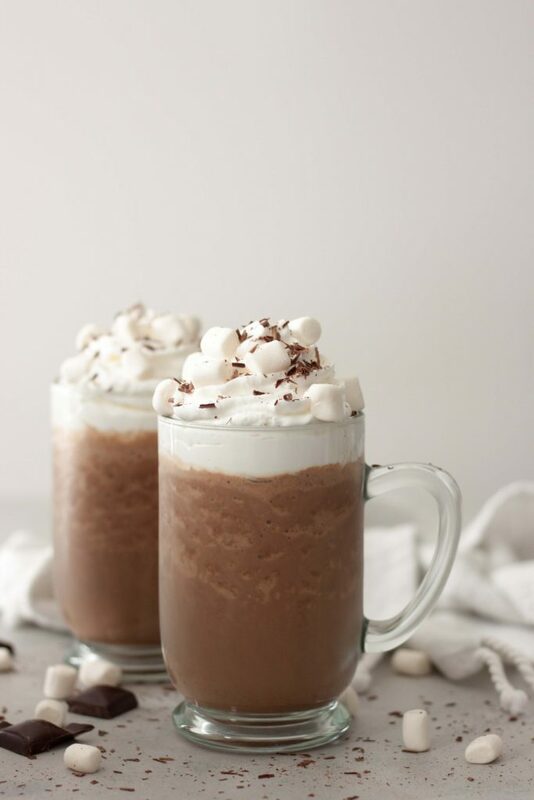 Couldn’t help but share this recipe today, even while it might sound a little crazy for this Minnesotan we’re whipping up Frozen Hot Cocoa to celebrate. Even if temps are below freezing outside, and yes it’s snowing today! Tomorrow on National Hot Cocoa Day I’ll be sharing a couple more favorites on Instagram Stories, including one I shared over the weekend and a healthy superfood packed favorite that’s really easy! While we normally would go for a warm version (and only on occasion) I couldn’t help but share this fun one as it was one of the first blog posts almost 5 years ago was Frozen Hot Cocoa. My how my posts have changed. I still can’t believe it was so long ago and this version is even better (and a little healthier)! Pretty much the same but we like to add in a little superfood boost now with a scoop of Navitas Organics Cacao & Greens Organic Superfood Blend (with protein, vitamins, minerals, greens, and digestive enzymes) or use a plant-based protein milk like Ripple. While it’s called Frozen Hot Cocoa which is kind of an oxymoron, because it’s frozen and not hot at all, I make ours with cacao and not cocoa as it’s packed with antioxidants, is less processed, and not as sweet as cocoa. So looking at this you are probably thinking it’s packed with sugar, super sweet, and not healthy. Nope it isn’t! 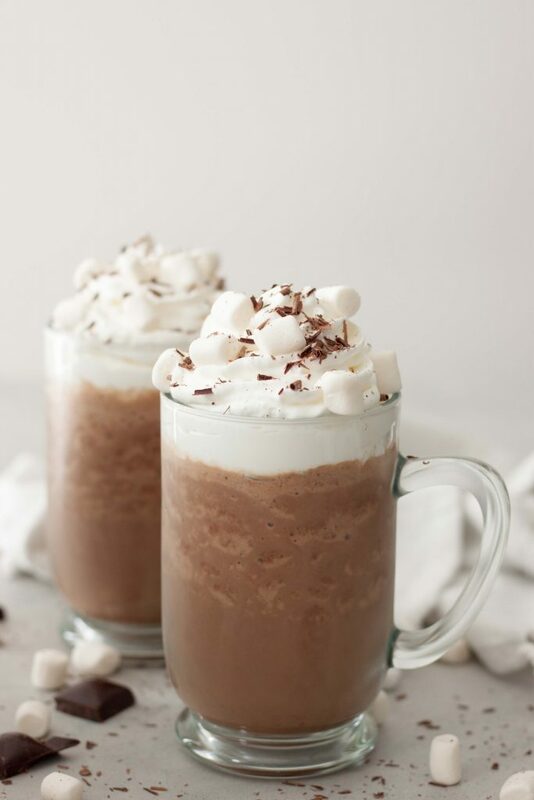 there are a few marshmallows and chocolate shavings but there isn’t a lot of sugar in it, especially compared to those coffee house ffff…frozen drinks. If you want to cut the sugar even more you can swap the maple syrup for stevia and you can omit the toppings or just use cacao nibs. I made the coconut whipped cream but did in this case add a little powder sugar for stabilizers (for photographic purposes, otherwise just for treats). So here is the funny thing, my girls aren’t huge hot cocoa fans! They go in phases but my oldest (S) has it maybe once or twice a year since about 5 years ago. My youngest (A) has it more often but is kind of picky and likes white hot cocoa more then regular and still is picky as she doesn’t like it too sweet. Nothing wrong with this and I still offer to make it when it snows or when we come in to warm up. I think it goes back to my childhood and all the memories of sipping on hot cocoa with cold numb fingers and nose. I’ll be enjoying one of these Frozen Hot Cocoas with a double shot of Cacao & Greens and maca (Gelatinized Maca Powder) after my workout tomorrow or might have one for dessert or a treat spiked. If you saw my Instagram Stories over the weekend you know what I bought to spike it with, a locally made Habanero Rum, adds a bit of warmth. Of course that would be a long shot for a Tuesday night, haha! Frozen Hot Cocoa with all the chocolate shavings sprinkled on by my little helper! If this Frozen Hot Cocoa isn’t your thing see the notes below for a warm hot cocoa version. Looking for something edible, how about Marshmallow Hot Cocoa Scones? 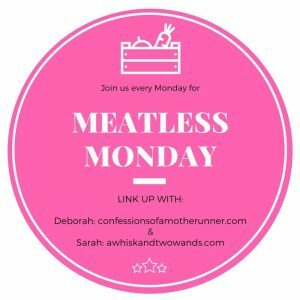 Tomorrow is National Hot Cocoa Day, but today is Meatless Monday! I wanted to share a salad or a ramen bowl I recently shared on Instagram but with National Hot Cocoa Day pushed those out but check out the linked up recipes below for most inspiration. My co-host Deborah and I look forward to seeing what’s cooking in your kitchen and hope you join us! 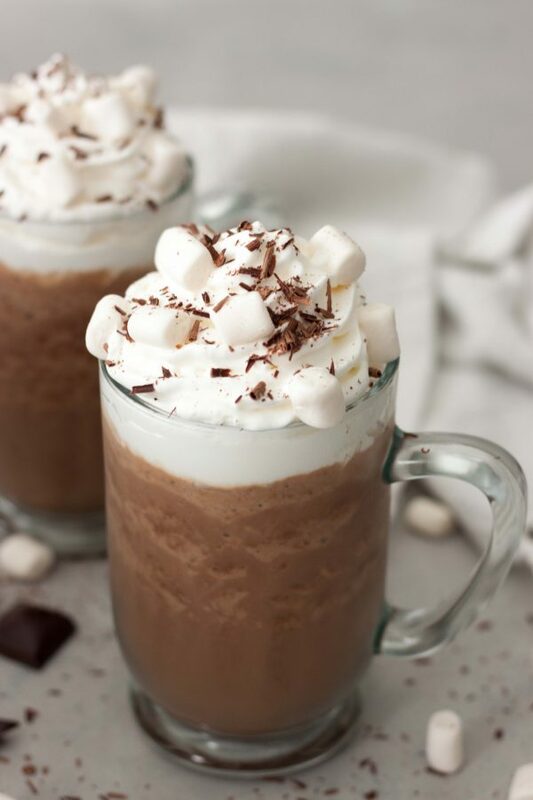 Have a little fun with Frozen Hot Cocoa, even if it's freezing outside! A simple healthy treat this is sure to be year round favorite. Gluten free, dairy free, vegan friendly with optional health boost add-ins. In a Vitamix, or high-speed blender, blend everything except the toppings together until smooth. 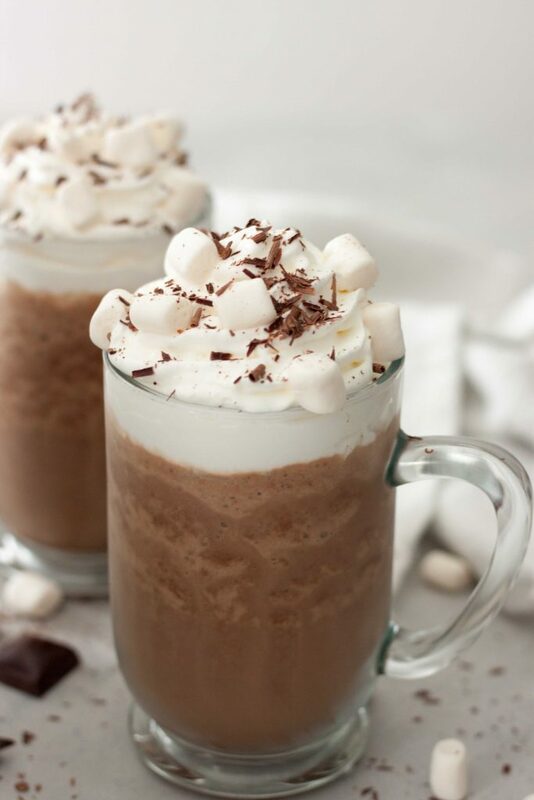 Pour into glasses and top with optional whipped cream, marshmallows, and or chocolate shavings. When making this with the added protein powder we like to use Unsweetened Coconut Milk or Unsweetened Cashew Milk. When making it without added protein powder we like to use a thicker milk like Unsweetened Ripple Plantbased Protein Milk or a homemade nut milk. If making without added protein I usually stick to 2 cups of ice to keep the flavor and consistency. I only add the maca powder when making this for myself or my husband. This can be made into a warm hot cocoa not adding ice or protein powder and heating it up. This is also delicious with a drop or two of peppermint for a Peppermint Frozen Hot Cocoa. I’m not so sure about wanting cold stuff right about now, but this sounds super yummy! I’ll have to give it a try when it warms up a bit. I love hot chocolate! Haha, I get it as it’s freezing here and we woke up to snow. Even not making it with the protein powder we have protein as we’ll use a protein milk. Perfect for the girls tomororw after soccer and gymnastics. This may need to happen after my workout today! I’m been on a hot cocoa kick at night, but it’s just too hot here during the day (80 today?!). I LOVE the toppings! YES! I’ll be making it post workout tomorrow maybe even a double dose of protein, half the cacao, and of course my maca! Now where’s your delicious cake, hope you link it up and share! Time to bundle up and blend one of these! I love that you’ve added maca. I’m kind of addicted to the Vega Maca chocolate bars lately. Vega Maca Chocolate Bars are one of my favs!!! What a fun frozen drink! Even though it’s so cold outside, one of these would be hard to pass up! You just snuggle up with a blanket and sip one! It’s single digits here. By the fire, post workout, anytime, I hope you enjoy it! You can count me in for a cup of this! It looks so good! Sounds good I’ll whip one up! I’m always looking for fireside drinks and this looks to die for! So so so happy it’s gluten free and vegan! YAY! If you want a real good one to sip fireside you’ll have to try habenero rum in hot cocoa. It isn’t super spicy and you just add a little to add some warmth.